Burbank, CA- April 2019…When Bobby Owsinski first created his Inner Circle Podcast 5 years ago, he had zero expectations. “I was amazed when we made it to 50 shows, but listeners really loved it and here we are more than 250 episodes later,” he stated. Indeed, people connected with music and audio everywhere have liked it enough to propel the Podcast into the iTunes Top 200 with a 5 star rating. 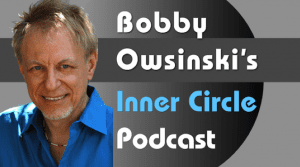 Bobby Owsinski’s Inner Circle Podcast features a combination of the latest music industry and production news along with insightful interviews with movers and shakers from throughout the music world. That encompasses musicians, engineers, producers, composers, music business and technology execs, and gear manufacturers who all tell how they got their start and reveal the inside scoop on what they do and how they do it. Among Bobby’s past guests include musicians like Blue Oyster Cult’s Buck Dharma and top session guitarist Tim Pierce; hit-maker engineers Al Schmitt, Ed Cherney, Richard Chycki, and Andrew Scheps; producers Michael Beinhorn, Stonebridge and Robert Margouleff; composers Richard Gibbs, Rich Tozzoli and Brian Schmidt; the Recording Academy’s Washington lobbyist Daryl Friedman and former EMI top exec Rupert Perry; gear manufacturers EveAnna Manley from Manley Labs and Dusty Wakeman from Mojave Audio, and many more. Bobby’s 5th anniversary episode features a tribute to the genius of the late Beatles engineer Geoff Emerick in a conversation with his long-time assistant and best friend Bill Smith. In the episode we learn a lot about Geoff the engineer and the man that even those who knew him might not be aware of, as well as an inside look at some of his recording and mixing techniques from someone who was by his side for many projects. Bobby Owsinski’s Inner Circle Podcast can be found at BobbyOInnerCircle.com or either on iTunes, Stitcher, Mixcloud, Google Podcasts (for Android users), Google Play, Spotify, and now RadioPublic.